Asian Geographic Magazine celebrates Asia in all its rich diversity, from its natural environment to its assortment of wildlife, cultures and scientific discoveries. Beauty of Fauna and Flora in Nature is a blog recording sightings of some of the fascinating and beautiful creatures especially butterflies, dragonflies and plants in nature. Beetles@SG BLOG is a platform for the sharing of information and knowledge on beetles found in Singapore. Bugs & Insects of Singapore is a blog on nature macro photography of bugs, insects and wildlife. ButterflyCircle is an on-line community of passionate butterfly enthusiasts who share a common interest in Nature’s flying jewels. It was started by a small handful of nature lovers who have been observing butterflies since their childhood days. Celebrating Singapore’s Biodiversity is a blog that celebrates our marvellous biodiversity, as part of the International Year of Biodiversity 2010, and features news, events, articles and other information about our biodiversity. Climate Education Network connects Singapore climate educators with educational opportunities to develop young environmental representatives. Dragonflies & Damselflies of Singapore is a nature photography blog about dragonflies and damselflies. EarthFest is a new low-waste sustainability festival in Singapore. Fusing food, a farmer’s market, edutainment, and local talent, it tries to inspire and empower people to make a modern and sustainable future possible. Eco-Business serves the Asia Pacific’s cleantech, corporate responsibility and sustainable business community. Ecology Asia covers the fauna in Southeast Asia, with photos, descriptions, publications and news. Eco Walk the Talk is a non-profit environmental website with an Asia focus. It covers eco news and insights, offers green living tips, and features people who inspire with their environmental thoughts and action. Energy Efficient Singapore is an initiative of the Energy Efficiency Programme Office, a multi-agency committee led by the National Environment Agency and the Energy Market Authority, to promote and facilitate the adoption of energy efficiency in Singapore. Fair Trade SG is a community mailing list for people in Singapore to share and learn about Fair Trade and ethical consumption. Flying Fish Friends is a blog by botanist, Joseph Lai, on nature and biodiversity. Gaia Discovery is an online lifestyle magazine designed to give people around the world an insight into sustainable development and tourism. Green Business Singapore is the leading online sustainability toolkit for businesses in Singapore, with a green editorial focus on Strategy and Leaders, Operations and Culture, Design and Tech, and Marketing and CSR. Green Collar Asia is a thought leadership portal with the aim of engaging professionals and organisations around sustainability and leadership. Green Culture Singapore is a gardening website and discussion forum. Green Issues by Agy is a blog on refashioning, upcycling and sustainable fashion. Green is the New Black brings together truth seekers, change makers and thought leaders across conscious living and business for a one-of-a-kind festival that pushes limits and breaks new ground. The Green Mark Buildings Directory lists the Green Mark certified buildings in Singapore and overseas. Green Mark is a green building benchmarking scheme by the Building and Construction Authority (BCA) to achieve a sustainable built environment by incorporating best practices in environmental design and construction, and the adoption of green building technologies. Greenstore is Singapore’s first review and rating guide for green consumers. The aim is to curate, review and rate green, eco, sustainable, organic, and ethical products and services that benefit consumers, the environment and the community. Habitatnews provides natural history news for the busy Singaporean – highlighting talks, books, events and issues, in nature, biology and the environment. LepakInSG is a one-stop calendar listing environmental events and activities in Singapore. Little Green Dot is an eco-friendly directory and blog for Singapore, about organic and natural options for home, family, beauty and lifestyle. LOHASIA Singapore is a community who care equally about the health of themselves, others and the planet. Low Carbon Singapore is an online publication dedicated to help Singapore reduce her carbon emissions and move towards the goal of a low carbon economy. The aim is to educate individuals, communities, businesses and organisations on issues relating to climate change, global warming and clean energy, and to help them take action and reduce their carbon footprint through useful information, news, tips, products and resources. Macro Photography in Singapore shares the diversity of small critters in Singapore, with occasional subjects from around the region. MND Singapore is the blog of the National Development Minister Lawrence Wong, where he hopes to share some of his thoughts and considerations on MND-related issues in Singapore, and reach out to all stakeholder. My Nature Experiences is a blog about a teen’s experiences in nature, with interesting facts, photos and thoughts about nature walks, bird watching and trails. Nature in a Concrete Jungle is a blog on nature and biodiversity found in Singapore. Nature rambles is a blog about walks amidst nature, and talks and writings about nature. Psychedelic Nature is a blog about nature’s little wonderful creations. Save Food Cut Waste is a ground-up campaign educating individuals, businesses and organisations in Singapore about the environmental and social impacts of food waste, and encouraging everyone to take action in reducing food waste. Secondsguru is a website dedicated to sustainable lifestyle. It seeks to create an environmentally responsible community, and is especially focused on Singapore. sgbeachbum is a blog on nature bits from in and around Singapore. Singapore Eco Film Festival is an inspirational event bringing together all the eco organisations, storytellers and artists in Singapore, to celebrate their efforts towards a sustainable future and accelerate their impact. The Singapore Environmental Industry Directory is a comprehensive directory on environmental management, technologies, water and wastewater treatment, air pollution control, pest control, and sustainable energy companies. The goal of Singapore Freecycle is to reduce waste by connecting people who are throwing away goods with others who are seeking the same goods. The Singapore Sustainability Directory promotes Singapore’s sustainable products and solutions to the global market, and is led by Singapore Business Federation and supported by key government agencies and business associations for sustainability. The Sisters’ Islands Marine Park blog shares photos, stories and ideas for Singapore’s first Marine Park. The Sustainable Solutions Network is an online and offline platform to connect all environmental stakeholders in Singapore, centred on resource sharing, collaboration and inclusiveness. The annotated budak is a blog that covers nature and biodiversity in Singapore. The Green Bush is a blog on the environment, climate change and security and what all this means to a Muslim. The Pangolin Story is a project to introduce pangolins and the threats they face to the people of Singapore and the rest of Asia. The Plant Observatory is a pictorial database of plants found in Singapore. Veggie Thursday is encouraging people to try to incorporate veggie meals and go meatless every Thursday. VegVibe is a magazine that covers anything and everything that is vegetarian and vegan, and serves as a uniting platform for related issues such as health and nutrition, animal welfare and environmentalism. Waste is not Waste provides an online waste exchange that is easy and convenient for businesses and organisations to use, and which helps them reduce, reuse and recycle waste. 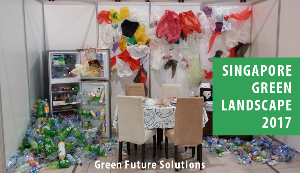 It connects businesses and organisations that generate waste materials with those who want the materials, thus helping both parties save time and money while helping the environment. Wild Happenings in Singapore is a one-stop location to showcase nature events in Singapore suitable for ordinary people: talks, walks, volunteer opportunities and more. Wild Shores of Singapore is Ria Tan’s blog where she shares photos and stories about the wild shores and marine life in Singapore. Wildsingapore is a one-stop location for those who want to learn about our wild places and do more for them. Wildsingapore news is a compilation of media and blog entries about nature and the environment that might be of interest to Singaporeans. Youth Against Climate Change: Cool It is ECO Singapore’s youth blog about climate change and UNFCCC COP happenings.